Creep. | The existence of this blog is all about my obsession with the world of horror. Urban Decay’s Naked Heat Palette! So Urban Decay casually decided to drop a beauty bomb on us today (6th June), they are releasing a brand new Naked palette. It’s officially launching on the 30th of June on Urban Decay’s website, but a limited few will be able to shop for it a bit earlier on the 12th of June. They haven’t released a naked palette since July 2015, and all I wonder is how did we manage so long? I am certainly loving the coral and violet hues this palette has compared to the previous Naked palettes. And it will definitely be perfect for summer 2017, I absolutely can’t wait to experiment with these shades. And I guess it’s safe to say orange is the new black, or smokey in this matter. I know I am posting after a long time, but I’m going to be brutally honest, I’ve been lazy and I had lost the inspiration to write on this blog. Fear no more.. I’ve returned and this time the inspiration is back as well. 2015 has been a year of horror because many films have been released. Insidious 3, Poltergeist and several others have been released and several others are set to be released a little later on. I’m most excited for the second part of the Sinister series, it looks pretty terrifying. Anyways now to get to the main topic of this blog post. 2015 marked the release of the movie ‘Unfriended’. I saw the trailer in like mid February and my mind was instantly was made up, it looked like it was worth a watch and the fact the concept of the movie looked pretty fresh and new. I was most glad when I dragged a friend to actually go watch it. The atmosphere we saw it in was perfect, there weren’t many people as it was the last show of the night. The movie is set in a way that we are not familiar with, it’s classified as a cyber-horror.. (the beginning of a new genre?) The whole movie is shown through one of the characters ‘Macbook’ computer screen. I enjoyed the plot of the movie and the fact that it holds several unexpected twists and turns. The whole movie gave me chills because in a generation such as ours, technology has already taken over. And the fact that these group of teenagers are being messed with on normal websites such as Skype or Facebook is pretty terrifying. So the next time you are skyping with grandma, BEWARE! Some paranormal force may be eavesdropping on your conversation and messing with you, only to find out its grandpa. I loved this movie and recommend it to everyone, it is definitely worth a watch and I can’t wait till the sequel of this film comes out in 2016. And watch the trailer of the 1996 version below. I know this whole year I haven’t posted at all. Which is very bad but I have had valid reasons. Firstly I’ve begun college therefore majority of my time has been devoted to writing college essays and assignments than posts for this blog. I’m not trying to excuse myself, just simply giving an explanation and an apology along with it. A lot has been going on in the horror world and I’ve missed to watch several movies that have been released. However I’m aiming to post more frequently now and I’ve got a whole list of movies, books and activities related to the horror world that I’m aiming to post about in the future. So keep following my blog if you already do and new comers feel free to subscribe. A Big Apology, AHS: Freak show & Annabelle. I know I haven’t written for this blog in quite a while now, but there were some personal changes to my life therefore i didn’t have much time to blog about any horror stuff I’d seen or heard about. Over the few months all I can think of watching was Annabelle in the cinema and the beginning of American Horror Story: Freak show. AHS has been amazing so far but personally I prefer the 2nd season. Don’t get me wrong the fourth season is definitely bringing a new flavour to the table however I’ve heard it’s Jessica Lange’s last season which is horrifying. The rest of the cast are truly amazing though, I thought I’d love Emma Roberts character like the last season but no, not really. Annabelle was a huge disappointment in my opinion and I’ll be doing a review on it sometime near the future. I’ll hopefully be blogging again. October is the month of a few many things that are vitally important in my life: My birthday, Halloween and of course the return of another AHS season! AHS: Freak Show looks creepier than anything I’ve ever seen on television before and i just can’t seem to contain my excitement. The first teaser is of a bird claw looking hand with a carnival ticket in the palm, I must admit that is a creepy looking claw hand. The second teaser is with the parted tongue which is gross and very creepy. The third and the fifth have the same woman in them I think? A woman with three legs is pretty much freaky. The fourth one is a woman trapped in a tiny bird cage, but we’re unable to see whether the woman is actually a bird herself or are there birds trapped with her? I mean you can hear chirping in the back. The sixth one actually got me scared, I mean that grin/smile has just burnt an image into my head and I can’t seem to get rid of that grin.. The seventh one is the one with the sword swallower.. OUCH! I mean is his oesophagus made out of some sort of sword proof cells? And last but not the least and certainly the creepiest of them all is the creepy creepy creepy (emphasise on the creepy) clown. Now whoever is afraid of clowns must be sh*t scared after viewing this, and the way the creepy smile turns into this devilish evil scream.. Also the eyes…. it’s just to creepy.. now the title makes sense and I just can’t wait for the return of AHS. 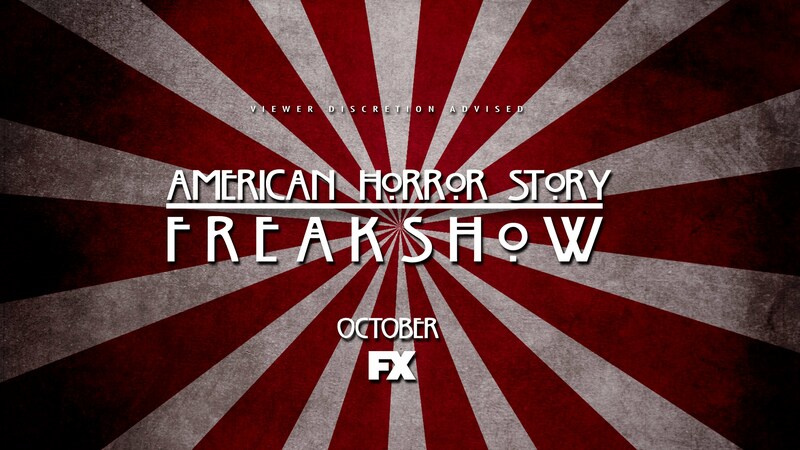 American Horror Story: Freakshow – Fan made teaser released. American Horror Story returns with its fourth season this October, am I excited? YESSSS.. There hasn’t been much told about the new season, but currently a fan made teaser has been released inspired by the new season. Its around 20 seconds long and depicts a fallen angel, there is melodious music playing in the background but near the end of the teaser a dark figure appears behind the fallen angel only to reveal some creepiness into the air. Whoever made this trailer, hats off to them because the captured the feel of the new season perfectly. It is unfortunate though how its a fan made teaser and not the actual thing. American Horror Story Season 4 Update & Spoilers!! It’s going to be carnival themed. Kathy Bates, Angela Bassett and several others from the previous season are confirmed to be returning for this season however there will be some new faces. An interesting twist in the whole, college students exploring an insane asylum. An upcoming Australian horror movie, the trailer actually gives you chills. I try to be as non-creepy as possible.